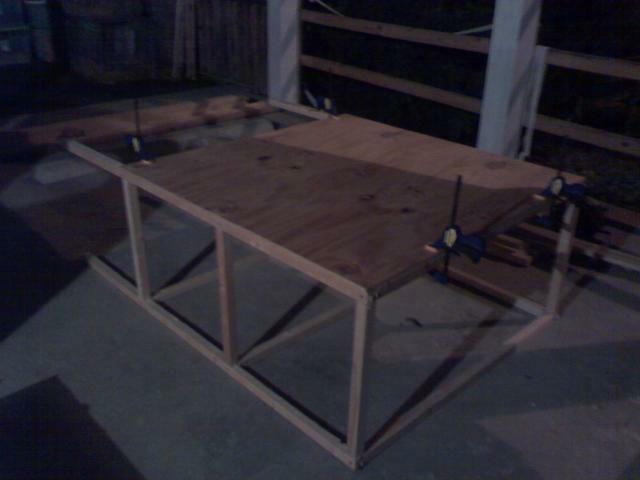 It also requires 2 sheets of plywood. I use the thin stuff......1/4" I think? I let Home Depot cut it in half for me, which makes two 4x4 squares. If you want, you can also have them do additional cuts (might cost extra). 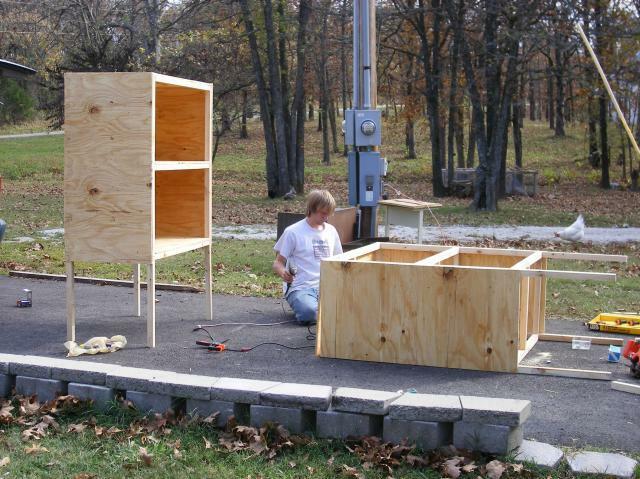 For this project you need 1 piece of 4'x4' plywood and 5 pieces of 2'x4' plywood. First, get your junk all out and ready to go. Look at your other projects in progress and sigh. Then move on. Cut all of your wood in advance. This makes everything so much quicker. I like to clamp the same length boards together so I know they are exactly the same size.....clamp together and then just make 1 long cut across them all intead of 4 individual cuts. Oh look, all done cutting and ready to assemble. First, lay out 2 of the 69" long pieces. These are the legs. Lay out 3 of the 45" long pieces, one at the top, one at 24" and one at 48". Screw them all together. I use 2.5" exterior screws for all 2"x2" to 2"x2" joints. Once you have one panel screwed together, lay the pieces for an identical panel directly on top and screw that panel together. This ensures each panel is identical so your levels will be pretty flat. Now you have two. The front and the back. 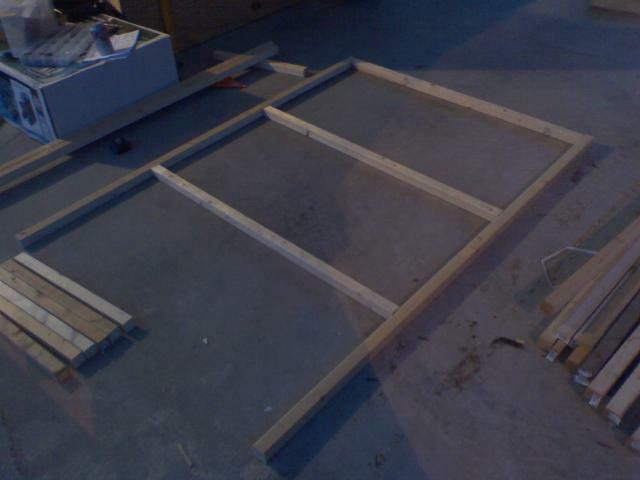 Then take 6 of the 21" pieces and screw them as shown below. Then flip that over so the short little 21" 'legs' stick straight up. Lay the other panel on top of this. And then screw it down. Your frame is now complete. Stand it up and admire. It will be wobbly....don't worry, once all the plywood is on it strengthens it. While you're admiring, decide which side is prettier.......that will be the front of your brooder. Then lay it back down...pretty front side DOWN. 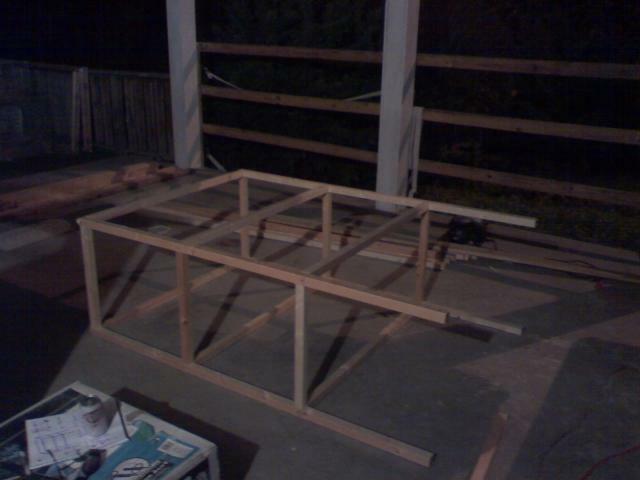 Take the 4'x4' piece of plywood and lay it on top. 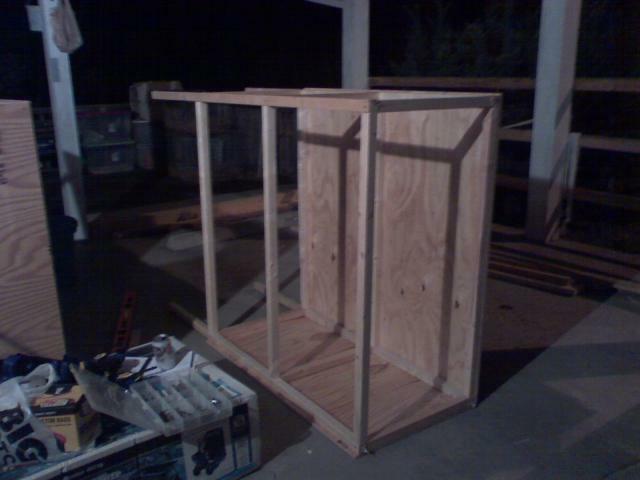 This will be the back of the brooder. Clamps are helpful to hold it in place. Screw it down. Then turn the unit onto its side. 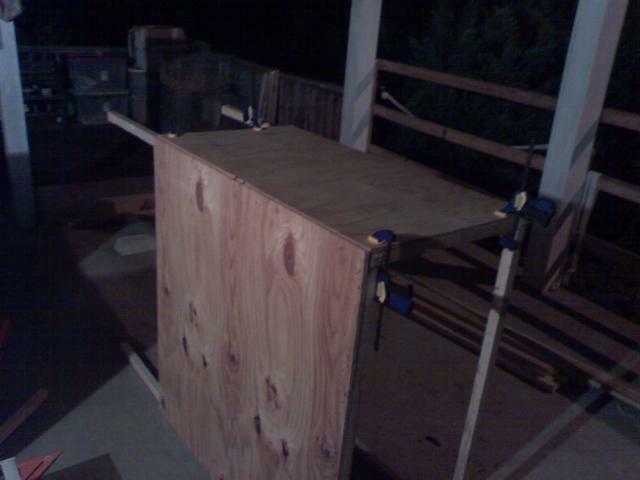 Place a 2'x4' piece of plywood on top, clamp into place. Then screw it down. Then flip the unit to the opposite side. and do the same. Go ahead and stand your unit up. Admire your hard work. Now you just need to put the floors in. 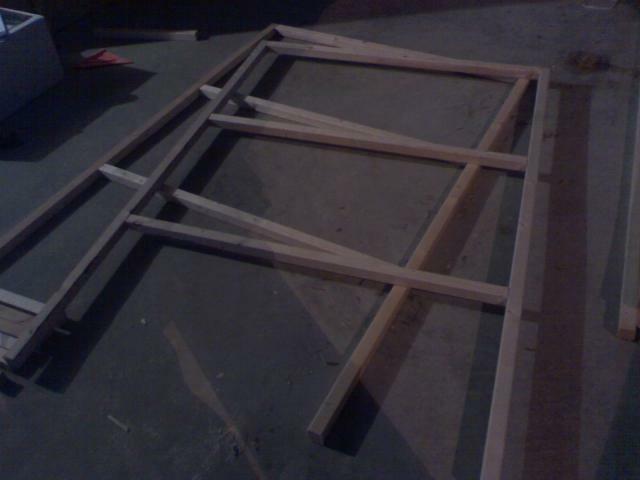 Take two of the remaining 3 pieces of 2'x4' plywood and cut a 1.5"x1.5" notch into each corner. This is to allow the plywood to fit around the 2"x2" LEG at each corner. Once the shelves are notched, slide them in and screw them down. 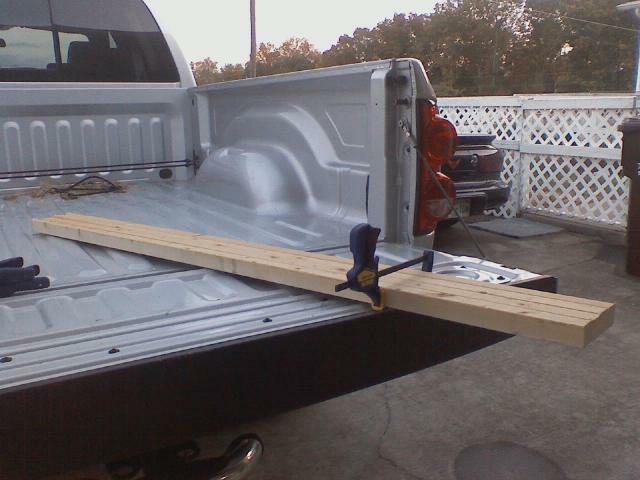 Then take the remaining single piece of 2x4 plywood, put it on top, clamp into place and then screw down. 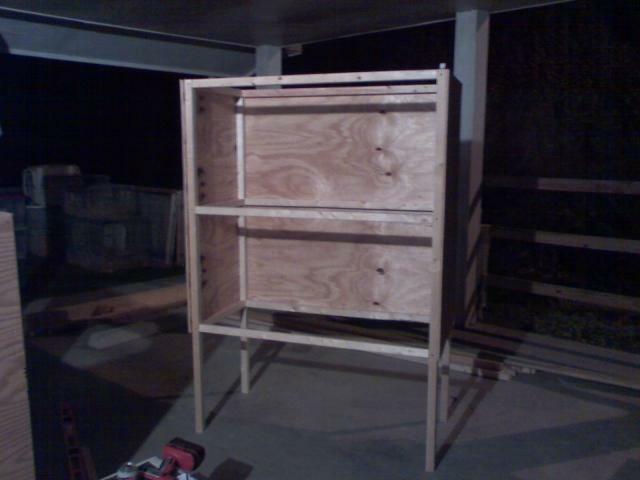 I ran out of plywood so don't have the top on yet.....therefore NO PICTURE. 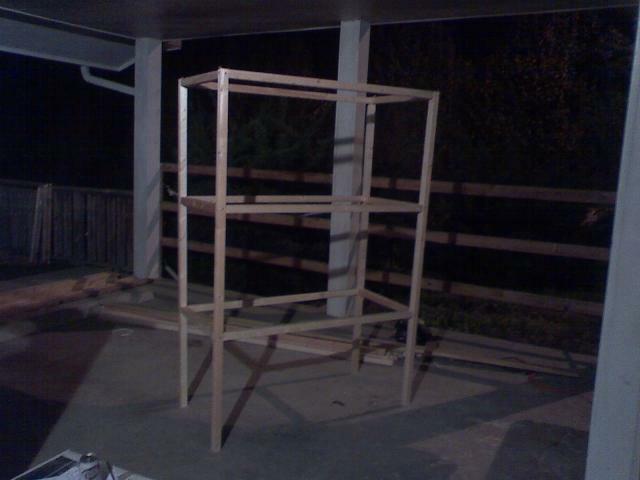 The front is kind of personal preference......i plan on using 1'x4' pieces of plywood VERTICALLY on each end. This will leave a 2 foot "door in the middle of both levels. 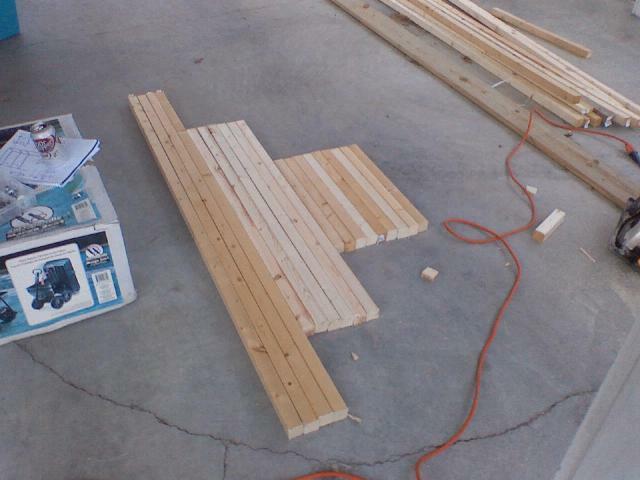 I will build a door for each, using 1"x4" boards and 1/2" hardware cloth, with a slidebolt for closure. ETA: I had 3 extra 21" pieces here because i forgot to put the "crossbrace" in the middle of each level. This can be added at any time. I will add it tomorrow. Also, I use 1.25" or 1 5/8" screws to screw the plywood down to the 2"x2"s.
Really, it doesn't get much easier than this! 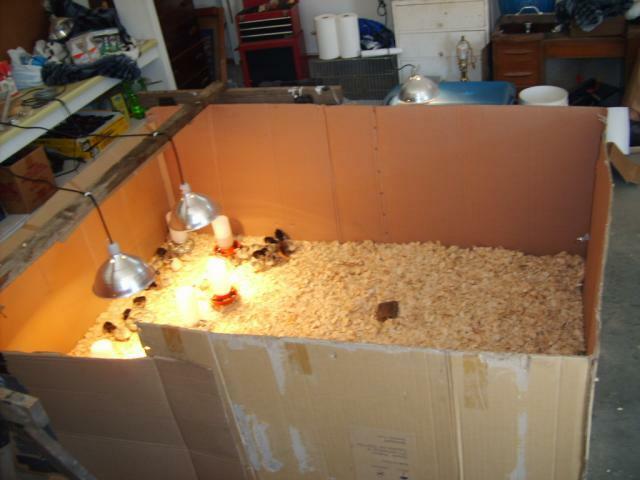 Supplies avy cardboard boxes, duct tape, old sawhorses, 2x4, heatlamps, and chicks! This brooder is 6 foot x 8 foot, and is 3 foot tall. You can make any size. I got the heavy cardboard boxes from the lumber yard and the furniture store. Simply rip the seam of a box, and overlap with the next box. Corners are the box corner. Duct tape, as needed. Floor is a layer of flat pieces of cardboard. I made a door (foreground) by overlapping at the end. The, "hinge," is just a bend in the cardboard. I used an old set of sawhorses to hold up a 2 x 4, for the heatlamps placement. Plastic (electrical) thingy used to hold cord in place. 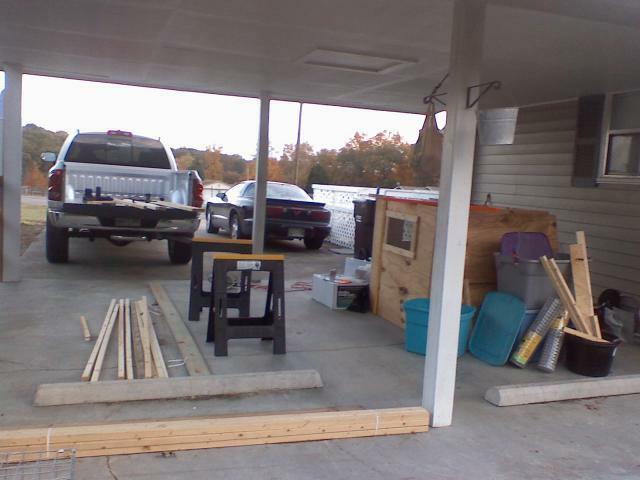 I did hammer a long nail through the 2x4 into the sawhorses, so it wouldn't slip off. The floor is a layer of cardboard, as well. Here it is covered in pine shavings. 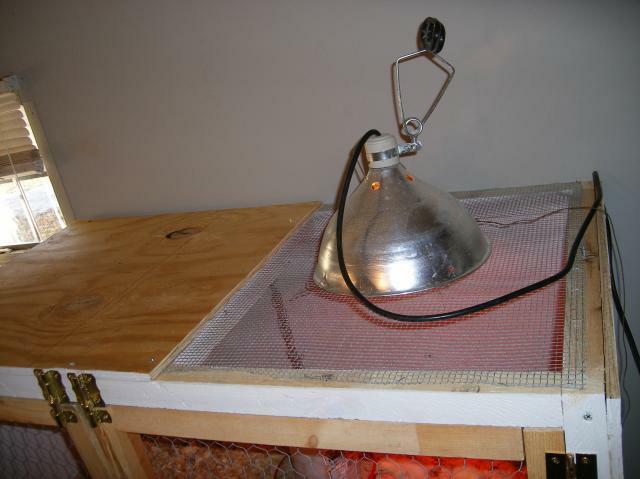 The heatlamps should have the protective brackets on, which is not shown in these photos. this is influential. I'm brooding quail, and need a more space and better confinement - we hatched 47 11 days ago and now they are getting flighty. 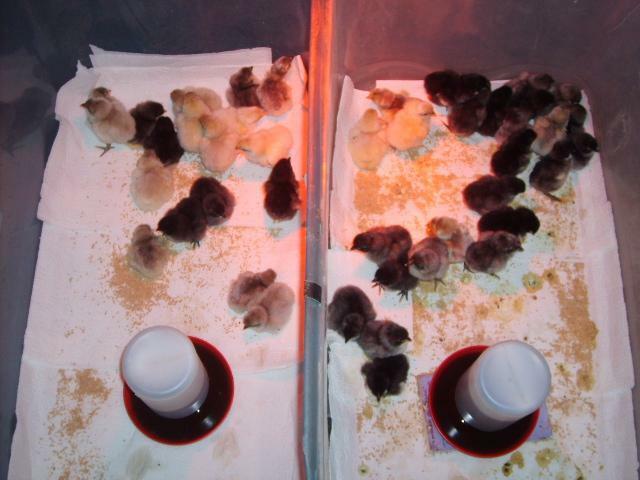 We expect to continue hatching in large batches once we are able to breed our new birds. 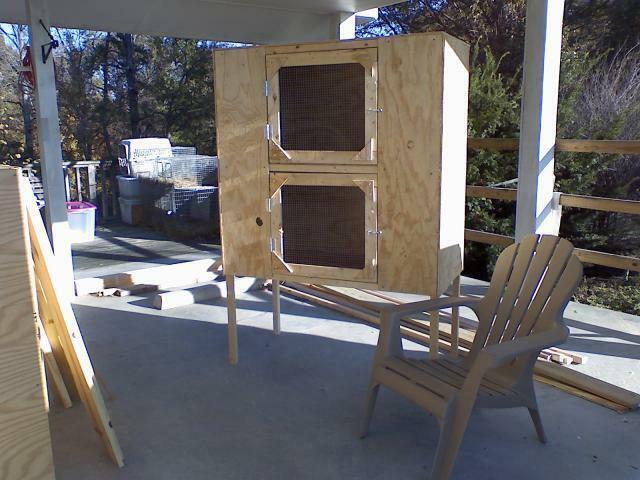 I think 1 of these two story brooders will allow us to breed 50 quail at a time without a problem. I will use the wood clamp trick! 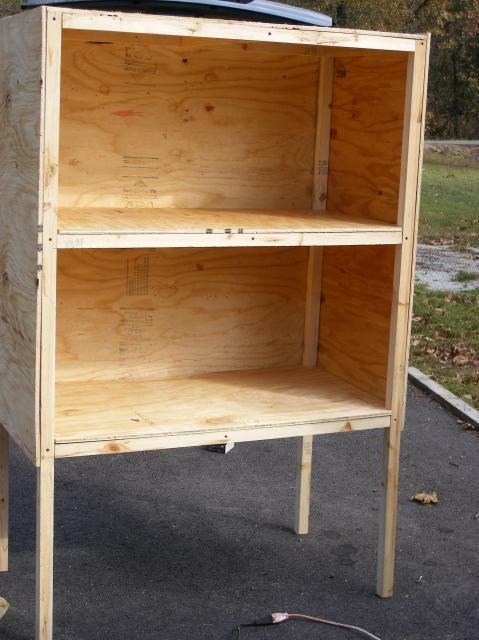 Good tutorial for building a large wooden brooder. Great article. Good instructions. I feel like I could do this quickly and easily. Just want to mention, if you are making box brooders; sometimes grocery stores have heavy cardboard bins that they will give away from apples, pumpkins, potatoes, etc. Just ask in the produce section of your grocery store! 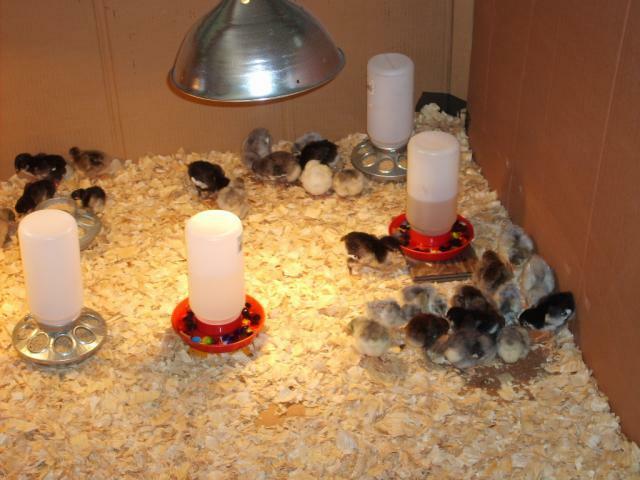 They make great (free) brooders! Another helpful grocery store item is the corrugated plastic temporary signs used to show sales on soda pop, etc. They can easily be cut to make extra tops for brooders to keep heat in, guards to keep straw, etc. in a nest, and whatever your imagination can think up! Love your tutorial. 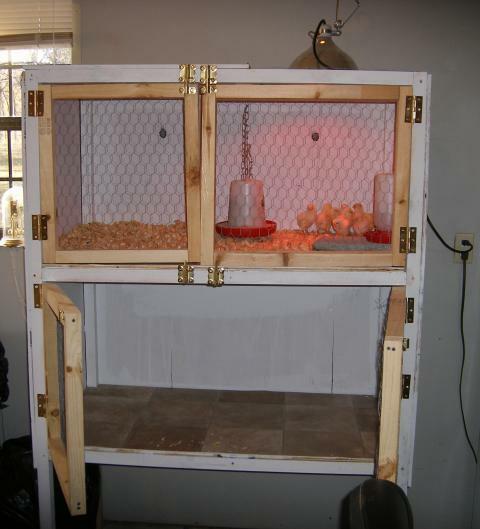 Just spent the day building the two level wooden brooder. (and rearranging the garage so there is a place to put it ) It will be a new home for a couple dozen birds later this week. 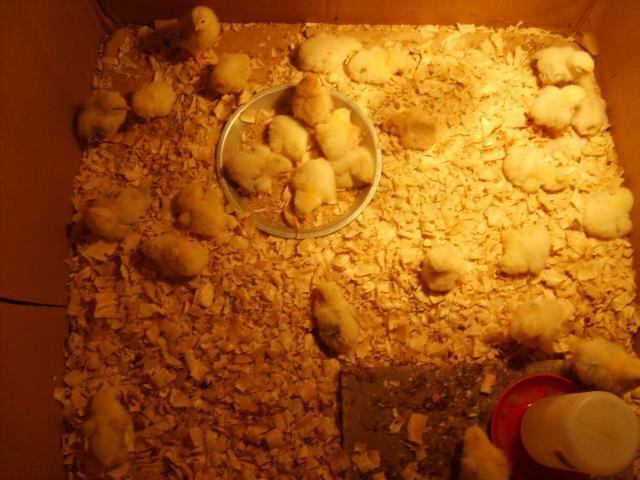 love the plastic tubs which I will try tomorrow getting fist set of chicks then. cardboard makes me nervous with those heat lamps afraid of fire.. Thanks I think I am going to use the Easy Peasy until I can make something better. Seems like this will work until they can be put into a pen on their own! This is awesome but i made a twist , i cutted the the left side on one storage box and cutted one right side on another storage box so it can both be connected , ,Thanks for this info. ! 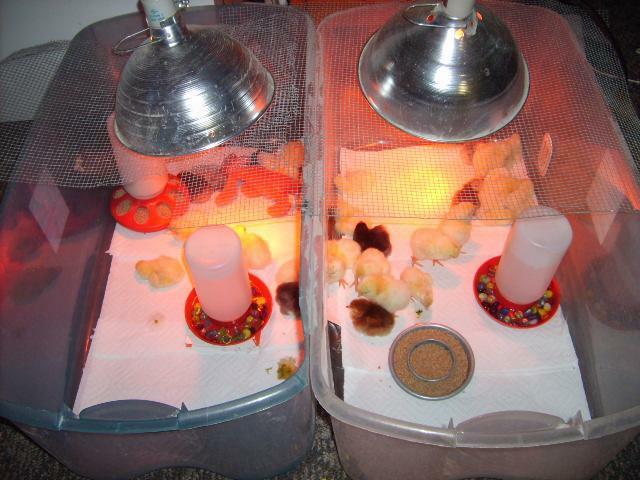 Thanks for the inexpensive and "reclaimed" use of items to make brooders. I am gonna be a proud mama come this friday of 3 day old chicks and am glad to see that I can use an old rabbit cage, with some newspaper on the floor and some old former photography equipment lights for the heat source. Now all I need is the chicks and to finish building my tractor-it gets warm here starting around the end of April and stays that way thru early fall! Yes, they are connected. I cut a hole in each one and made a little tunnel like door (taped the 2 together). are those 2 plastic tubs in the last picture connected? love the plastic tub idea, I can do that, this is my first time incubating. the kids are excited! I will have to "borrow" your design! ok, I see. Thanks, that helps alot. I've started on mine now. 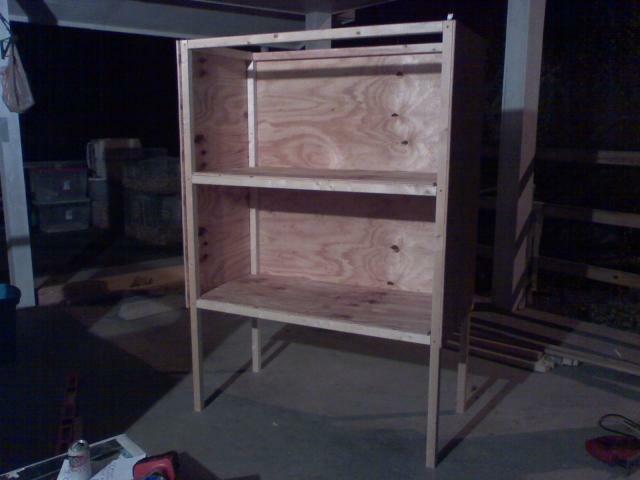 Not finished, need more plywood. I've posted pics on the JG thread. 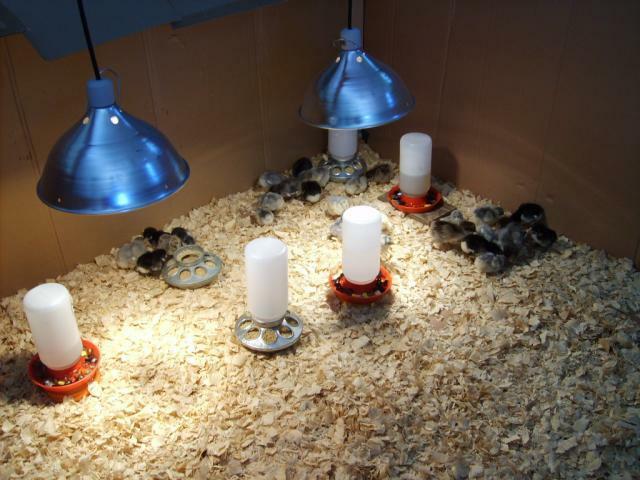 I love your brooders and what great ideas are to be had here! ChicwannaB, I added a picture. Actually, I thought I had it there before, but didn't. My doors are wonky. I just made them from the 2x2s and covered them in chicken wire. Mine are in the garage, so chicken wire was good enough. The heat lamp, I just laid on top of the top wire. Actually, I wired it down, so it wouldn't get jostled around. I think you can see it in a picture. Kathy, can you elaborate on this and give me a hint as to what you did for heat lamp?? Is there a hole drilled somewhere to run a cord out?? Also can you show a detail of the doors?? Thanks so much, I'm working on mine now. Will be a painfully SLOOOOOW process, too cold to be out in the pole barn every day. 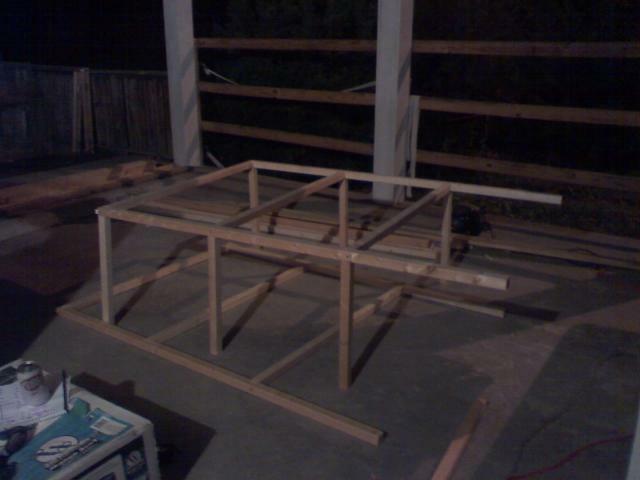 I got the 2x2 cut so far, plan on constructiong frame Tuesaday when temp rises a bit. Thanks so much, you're a dear for sharing this lovely and easy plan. What size are those plastic tubs? I'm thinking I like that last one, the two large plastic tubs. I'd love to build something more permanent later, but for this first venture I need to keep things as simple and inexpensive as possible. Those plastic containers look very functional. Thanks! you make it looks easy enuff for a ChicwannaB to do it!! I like your style. I really like these brooders. yes those are marbles, they are used to attract the chicks' attention and help prevent drowning.